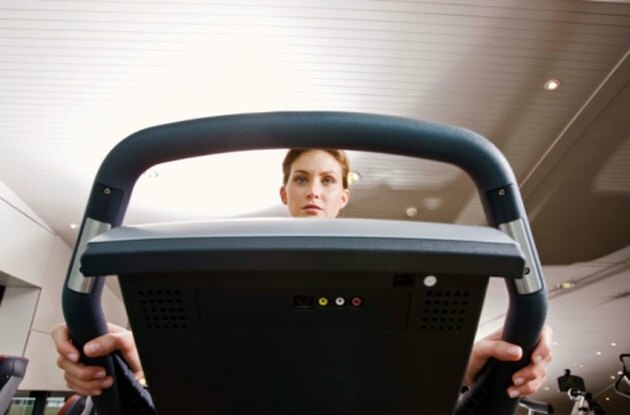 Many treadmills are designed to operate with a safety key. Inserting the key into a slot on the control console closes a switch and activates the internal electrical circuit. Making a treadmill run without a key is possible by installing a jumper bypass at the safety switch. However, most owner's manuals do not recommend operating treadmills without the safety features in place. Operating your machine without a safety key may lead to a potentially dangerous situation. Use an Allen wrench to remove the bolts on the console cover. Lift the cover and locate the safety switch. It will be in proximity to the key slot. Depending on the particular treadmill, the switch may or may not be attached to the console cover. Locate the wire leads on either side of the safety switch. Most often, the switch is enclosed in a housing and a pair of leads may attach to terminal posts on the housing. Remove the leads from the terminal posts by turning the brass screws counterclockwise with a small screwdriver. If the leads do not terminate outside the switch housing, use wire strippers to cut the leads close to the housing. Strip the ends of the switch leads 1/4 inch to expose bare wire. Twist the ends of the stranded wire tight with your fingers. This is necessary for a good contact. Cut a piece of insulated wire as a jumper bypass that attaches between the ends of the switch leads. Strip the ends of the jumper wire 1/4 inch and twist the stranded wire ends. Insert each end of the switch leads into an insulated crimp connector. Crimp the connectors with the wire strippers to secure the wires. Insert the ends of the jumper into the open ends of each crimp connector. Crimp the connectors with wire strippers. Wrap the jumper wire and crimp connectors with electrical tape. Continue the wraps onto each of the switch leads. Replace the console cover and reinstall the bolts that hold it in place. Plug in the treadmill power cord and press the "Start" button on the console to turn the treadmill on. Soldered connections can be used in place of crimp connectors. Refer to the owner's manual or solicit the manufacturer for a wiring schematic, if necessary. Use a similar gauge and type wire as the jumper bypass.